With AirPlay, you can stream music, photos, and videos to your Apple TV, or stream music to your AirPort Express or AirPlay-enabled speakers. And with AirPlay Mirroring, you can display your iOS screen on your Apple TV. If you want to stream iTunes Store content, you also need an Internet connection. Connect your iOS device and Apple TV or AirPort Express to the same Wi-Fi network. 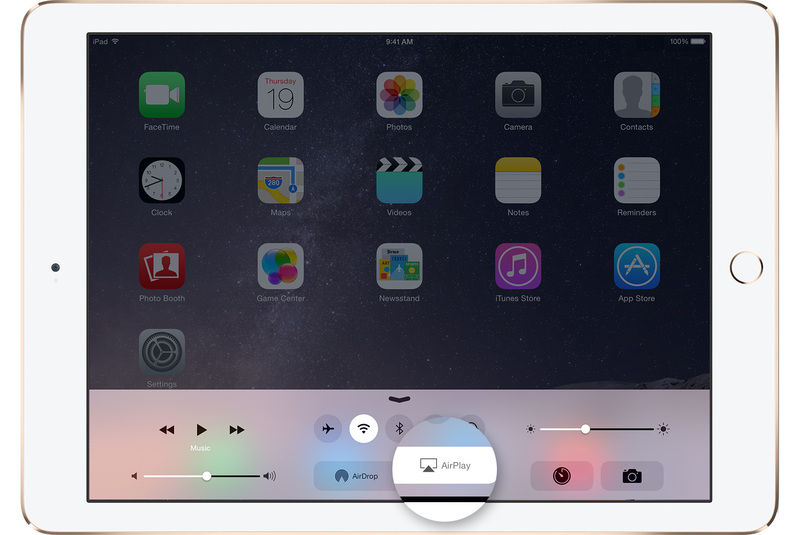 On your iOS device, swipe up from the bottom of your screen to access Control Center. Tap the name of the device you want to stream content to. You'll see icons of a TV screen or speaker next to each device so you know what type of content you can stream. On iPad, you might need to scroll to see all of the available devices in the device list. When you use AirPlay Mirroring, your TV uses the orientation and aspect ratio of your device. If you want the image from your device to fill your TV screen, you might need to to adjust your TV's aspect ratio or zoom settings. Tap your device at the top of the AirPlay list. With peer-to-peer AirPlay, your iOS device and Apple TV don't have to be on the same Wi-Fi network. You can stream content to your Apple TV (3rd generation rev A, model A1469 or later) with software version 7.0 or later. Find out which Apple TV model you have. Make sure that both devices have Wi-Fi and Bluetooth turned on. Before you can stream content from your iOS device to your Apple TV, you might need to check a few settings. These steps can help. Make sure that you have the latest software on your iOS device and Apple TV. Make sure that both devices have Wi-Fi turned on. On your iOS device, go to Settings > Wi-Fi. On your Apple TV, go to Settings > General > Network. 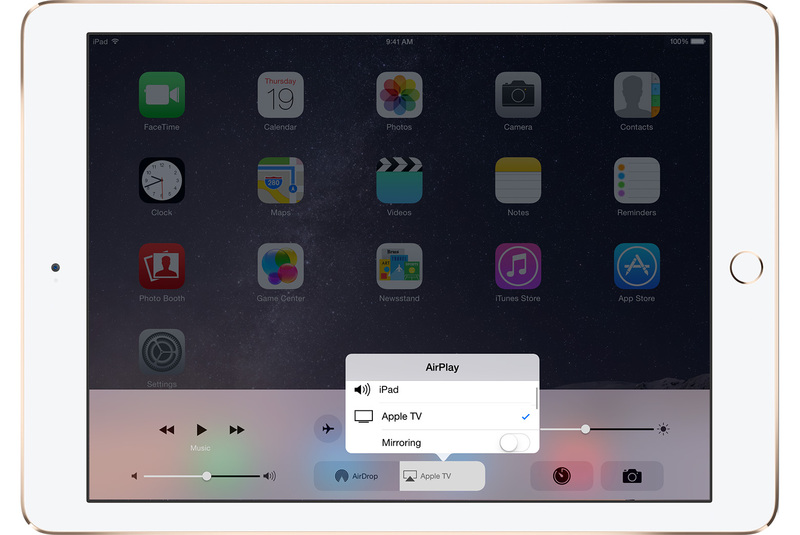 If you're trying to use peer-to-peer AirPlay, make sure that both devices have Bluetooth turned on. On your iOS device, go to Settings > Bluetooth. On your Apple TV, go to Settings > General > Bluetooth. When an AirPlay-enabled device is available, you'll see AirPlay in Control Center on your iOS device. Restart your iOS device and Apple TV. Connect both devices to the same Wi-Fi network. On your Apple TV, go to Settings > General > Network. If your Apple TV is connected using Ethernet, make sure that it’s plugged in to the router you're using for Wi-Fi. On your Apple TV, make sure that AirPlay is turned on. Go to Settings > AirPlay. Make sure that the device you want to stream to is plugged in and powered on. If you’re using an iPad, scroll up and down in the device list to see all of the available devices. You can't use AirPlay to stream to content from your iOS device to another iOS device, a Mac, or a TV without Apple TV. To stream iTunes Store content, your Apple TV needs to be connected to the Internet. Check your Internet connection and try again. You might not be able to stream videos if the app you're using doesn't support AirPlay video playback. Check the app's product page or website to see if the app works with AirPlay. Make sure that the volume is up (not muted) on your iOS device and Apple TV. If you're using an iPhone or iPad, check the Ring/Silent switch. If it's set to silent, you'll see an orange line. Toggle the switch to turn the ringer on. Some apps might stop AirPlay when you lock your device or put your device to sleep.